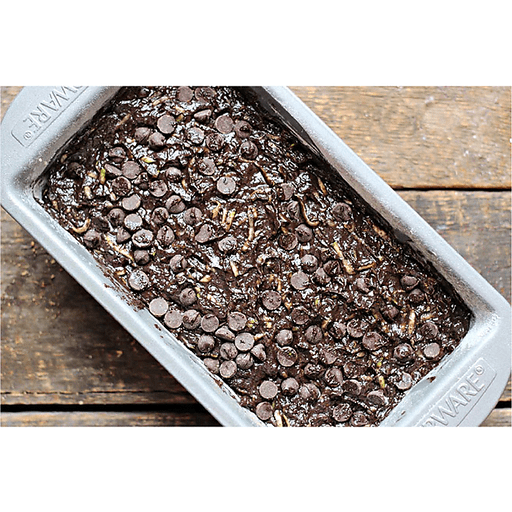 This moist chocolate zucchini bread is studded with extra chocolate chips. 1. Preheat oven to 350°F. Grease and flour an 8x5 inch loaf tin and set aside. 1. In a large bowl, cream together butter, oil and sugar until light and fluffy, then beat in the eggs one at a time until completely combined. Stir in the cocoa powder, vanilla extract, salt and baking powder. Fold in the grated zucchini, and then add the flour and ½ cup chocolate chips to the bowl. Stir until just combined. 1. Transfer the batter to the loaf tin and spread out using a spatula or the back of a spoon. Top with 2 Tbsp. chocolate chips. Bake for 45-55 minutes, until the bread has risen and a toothpick inserted into the center comes out almost clean. 1. Let the bread cool in the pan for 10 minutes before turning out onto a wire rack to finish cooling. Calories 280, Total Fat 14g (Saturated 5g, Trans 0g), Cholesterol 50mg, Sodium 240mg, Total Carbohydrate 37g (Dietary Fiber 5g, Sugars 17g), Protein 5g, Vitamin A 6%, Vitamin C 10%, Calcium 8%, Iron 20% *Nutritional values are an approximation. Actual nutritional values may vary due to preparation techniques, variations related to suppliers, regional and seasonal differences, or rounding.